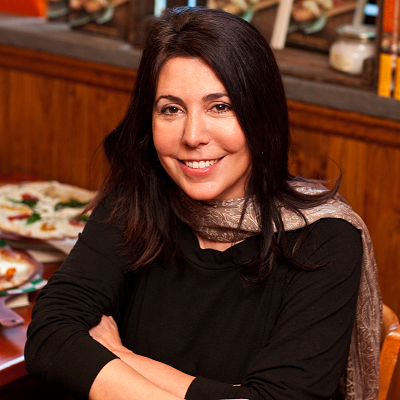 Laura Pensiero is the founder, owner and creative force behind Gigi Hudson Valley (Gigi Trattoria and Gigi Catering.) A fast growing Hudson Valley company, Gigi HV believes good health and great flavor go hand in hand. Laura’s background as a chef and nutritionist combined with the culinary bounty of the Hudson Valley creates the perfect union. Pensiero strongly believes that local food in season is the basis for healthy flavorful eating. This reflects the Gigi Hudson Valley Mediterranean style of cooking, marrying what is fresh and in season with simple, yet bold and elegant flavors. Her award-winning restaurant, Gigi Trattoria, was one of the first in the Hudson Valley to source the bulk of its ingredients directly from local farmers, ranchers and food artisans when it opened its doors in 2001. Additionally, Pensiero was just recognized by the Victoria A. Simons Locavore Award for her work in promoting local agriculture. Laura is also a partner of Just Salad, a collection of seven healthy “fast food” salad restaurants in NYC and two licensed outlets in Hong Kong. She develops the menu and recipes and continually oversees the quality and nutrition for the brand. A graduate of the French Culinary Institute, Laura is also a registered dietician. In 2009 she wrote Hudson Valley Mediterranean: The Gigi Good Food Cookbook (HarperCollins) sharing her flavorful and practical approach to wholesome and ealthy eating. She also co-authored The Strang Cancer Prevention Center Cookbook (McGraw-Hill 2004; Dutton 1998) and contributes frequently to national magazines as well as sharing recipes and cooking tips on her blog. Laura’s focus is on supporting her community via Gigi Hudson Valley and through her work in writing and education. She believes the best education is the practical kind; the food on a plate. She aspires to teach people that eating healthy can be delicious, without sacrificing flavor or satisfaction. Her efforts were recognized in the Fifth Anniversary Issue of O when Oprah Magazine named Laura among the ‘Five Most Giving and Gifted Food Professionals’ for her work as a nutrition and culinary educator. Today, her 60+ employee business is creating a new and sustainable model for elegant yet rustic dining based upon locally sourced ingredients, personal wellness, and community engagement.